Recently, the DC All Access team teased the arrival a new Justice League trailer. They may have just been messing with us, but many fans are still hoping the first real-deal trailer for Zack Snyder's follow up to Batman V. Superman: Dawn of Justice will be coming soon. If it does, we may have some information about what fans can expect to see in it. This potential information about the upcoming Justice League trailer comes from a post by an anonymous user on 4Chan. That being the case, we can't possibly lend a ton of credibility to it, but none of what is being said sounds overly outlandish and much of it would seem to make sense. Here is what the anonymous poster had to say. "The first trailer for Justice League was edited simultaneously with the second Wonder Woman trailer. Right Now the whole Marketing campaign of the film is being prepared, in the studios TrailerPark. I do not know the exact date of the premiere of the trailer, it depends on the client, which in this case is WB. I can offer you some data of what we will see in the new trailer: There are no Superman scenes, sorry. No scenes of Mera, Vulko and Gordon. Junkie XL design the music of the advance, you will have a small look at the main theme of the film, it is a remastering of the intro of the animated series. There are action scenes in Slow-motion. (Flash). Aquaman will be the best part of the trailer. The trailer will end with the first look at Steppenwolf, something similar to the Avengers 2 teaser." There is a lot to dig into there, but perhaps the juciest bit is that Superman won't be in the trailer at all. He is at a bit of a disadvantage, since he is dead at the moment, but Zack Snyder has basically confirmed that Henry Cavill will be back and we even saw him in costume in a behind-the-scenes video the director posted last month. As far as Jason Momoa stealing the show as Aquaman in this trailer, that seems like something that has been corroborated elsewhere. Heroic Hollywood Editor and self-proclaimed "ace-scooper" Umberto Gonzalez recently had this to say in a tweet. "Take this with a grain of salt but I hear the next #JusticeLeague trailer is AWESOME & that Momma's #Aquaman steals the show!" So that would at least seem to corroborate some of what this random 4Chan poster had to say. Assuming some of the other details are correct, we can look forward to a Justice League theme that is reminiscent of the animated series. In addition, we will also be getting to see the main villain Steppenwolf, who is being played by Game of Thrones star Ciaran Hinds. The post compared it to the teaser for Avengers: Age of Ultron, which teased James Spader's Ultron at the very end of the trailer. A Justice League trailer was released during San Diego Comic-Con over the summer, but Warner Bros. made it clear that it was something that was put together just to show those in attendance at the event, even though it was released online right away. So this trailer that is allegedly coming out soon will be, in a way, the first real trailer we have seen for the movie. The movie is still nearly a year away, so Warner Bros. may make us wait a little while before dropping this trailer. Or they could want to build hype early, like Lucasfilm did with Star Wars: The Force Awakens. Here is the official synopsis for the movie. 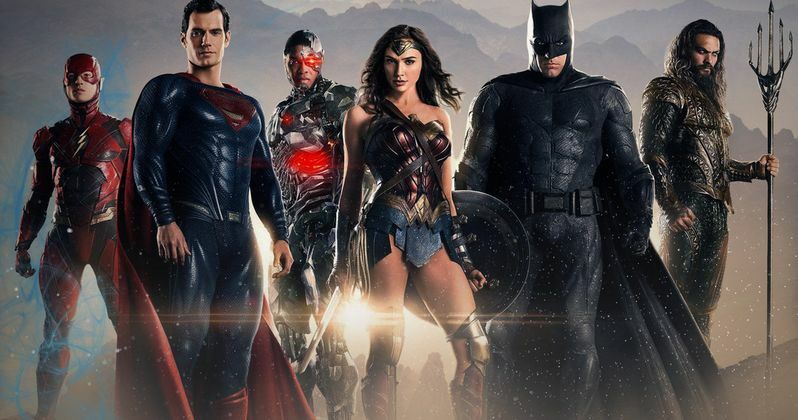 Justice League features a cast led by Ben Affleck as Batman, Henry Cavill as Superman, Gal Gadot as Wonder Woman, Jason Momoa as Aquaman, Ezra Miller as The Flash and Ray Fisher as Cyborg. The movie is being directed by Zack Snyder and is set for release on November 17, 2017. We will be sure to keep you up to date as information on this new Justice League trailer becomes available.